I'm not the world's greatest modeler, but I'm improving. I guess you just have to keep on practicing. I started doing this when I had pneumonia and couldn't do much else. I also have an interest in WWII vintage aviation. 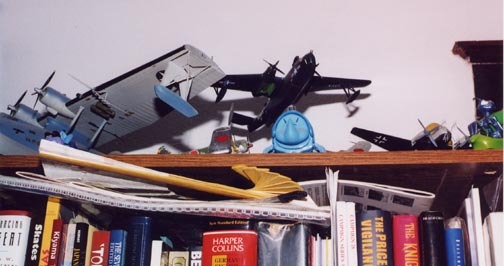 A lot of planes from those days are gone, or hard to see, so the only way to get an idea of what they looked like is to build a model. Like everyone else, I have an incredible backlog of models that need to be built. Also some hints for other novice modelers. Superglue, the special stuff they sell in model shops, such as Zap-a-Gap, is the key, plus an accelerator. You'll need all three of the different types of Superglue: super thin, super thick, and normal. However, don't use it on clear parts! (I wish I had known the first few models.) Instead, use white glue or the special clear drying glue (looks suspiciously like white glue, but more expensive) you can buy in model shops. Use the thin Superglue for joining together fuselage or hull halves. Use the thick stuff and the accelerator instead of putty for filling gaps. It can be filed and sanded. You can also use white glue for very minor filling. For aerials and rigging, don't use regular sewing thread. Use either the special thin thread for tying fishing flies or sprull. What is sprull? Take a piece of plastic parts tree, heat in the center carefully, and PULL! Depending on the temperature and how you pull, you can get thin threadlike strands of whatever thickness you desire. Sell your soul, but get an air brush and a compressor. This will lead to heart ache and ecstasy. Also get a real filter mask to save your health. The Paasche H brush is a good place to start. I like my Badger compressor. Forget about the propellant in a can. Now suffer. The key here is to keep everything clean and to ensure your paint is properly thinned and strained if necessary. Try to use the water based acrylic paints instead of the enamels if possible. However, they require more cleaning. Use silver paint as a primer, but careful which one you choose. I just made a big mistake with chrome silver. Silver plate works well if you can afford it. Make sure to buff it before applying colors over it. Definitely use aluminum plate for bare metal finishes. Don't prime under it. The surfaces have to be perfect before you apply it. For painting canopies, mask, use a fresh blade in an X-acto knife and cut away the material over the framework. Airbrush with the internal color, and then with the final color. Make sure the masking material is down really well. Remove residual masking adhesive with scotch tape if necessary. Scotch tape also works for masking flat surfaces. The key to decals is to have a smooth surface. Make sure that you airbrush on clear lacquer before you try the decals. You can get the acrylic stuff and it works. Also try Future floor wax. I should try it on my Linoleum someday. Depending on the decals, look into setting solutions, such as the Microsol line or vinegar. When the instructions warn not to use them, believe them! Tamiya decals don't appear to respond well to the setting solutions. 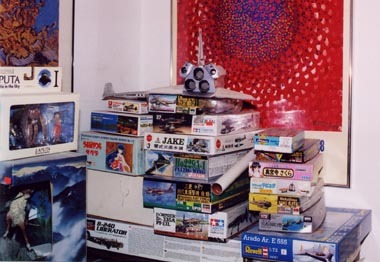 Here's a list of some of my model kits. Some other models I've built that haven't gone to my cubicle (the graveyard) or the trash. Revell-Monogram 1/48 PBY-4. I liked this so much I have a PBY-5 stored that I want to build as a Black Cat someday. Revell retro Marlin re-release. Another kit I once did as a kid. Cute kit, even if the gun barrels are way too thick. Revell (Korea) Type XXI U-boat. It took me two tries to build this one. I destroyed the first kit, but salvaged the decals from it. The kit itself is beautiful. The problems were all mine. Hasegawa 1/72 SBD-5 (I dropped it and lost one of the radar aerials. I'll have to replace it some day. I ended up giving it away. 1/48 P-36 good model from Hobbycraft. Revell 1/72 snaptite B-26 that I tried to improve as an early 1942 version. Revell-Monogram 1/48 Helldiver. Nice model. Those bulges at the bottom of the canopy are correct. Ertl 1/72 Flying Wing, the experimental version with the double counter-rotating props. Fit is very poor on this model- requires a lot of work. Revell (Germany) Condor. A truly horrible kit with parts that fit like they came from different kits. I like the way it came out, but the decals were in bad shape and I damaged the unit insignia. Many of the others I replaced from my stock. Spruce Goose, out of loyalty to my former employer. This one had warped parts, but isn't too bad. 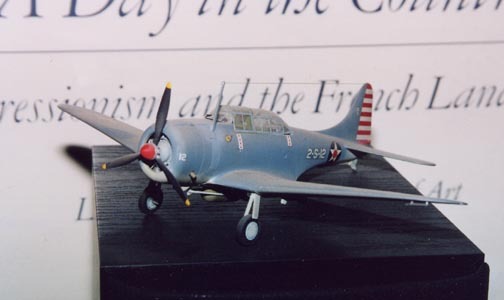 P-70 nightfighter in 1/48 from ERTL. Pretty decent kit. Bearcat in 1/48 from Hobbycraft. A pretty good model. F-14 in 1/144. Basically just a block of plastic. Revell (Korean) Type XXI U-boat.